If you’re an ice hockey fan, you are no doubt somewhat addicted to the excitement of seeing games live, in person. Yet one historical drawback to going to games has always been fearing those moments when you need or want to leave your seat, when missing out on the unpredictable action makes waiting in lines excruciating. While many teams in all kinds of sports have been busy installing television screens in concourses and concession areas to help keep fans connected to the live action, at SAP Center in San Jose the NHL’s Sharks have taken concourse display technology to a new level: With cutting-edge LED displays from Daktronics and the Cisco Vision IPTV display management system from Cisco, the Sharks have turned what used to be basically a dark concrete tunnel into a well-lit, display-laden walkway that can bring live game action and exciting, engaging marketing messages to fans while they are outside the bowl, keeping the excitement level high no matter where in the building a fan might be. The most visible part of the new display deployment, one installed in phases over the last two seasons, are the concourse LED boards from Daktronics, displays that were custom designed for the stadium’s walkways. Robin Hall, a regional manager for the Brookings, S.D.-based Daktronics, said there were a total of 17 displays added to the main concourse at SAP Center, all 3 1/2-feet tall but in many different widths, with one measuring almost 66 feet wide. Editor’s note: This profile is from our new VENUE DISPLAY REPORT series, a vertical-specific offering of MSR’s existing STADIUM TECH REPORT series. The VENUE DISPLAY REPORT series will focus on telling the stories of successful venue display technology deployments and the business opportunities these deployments enable. No registration or email address required — just click on this link and start reading! John Castro, vice president of corporate partnerships for the Sharks, said the concourse displays are just the latest step in an ongoing process to “keep the venue updated and modernized.” Now celebrating its 25th year in existence, SAP Center recently hosted the NHL’s All-Star Game and is a regular stop for such big-ticket events as NCAA basketball regionals and U.S. Figure Skating championships. In 2010, Castro said the arena added a new Daktronics center-hung video board, which has distinctive circular ribbon boards above and below that synchronize with the ribbon board that circles the arena in the middle of the seating areas. A few years ago, the arena put out an RFP to bring Wi-Fi to the stadium, and when it picked Cisco for the gear supplier, it also decided to use Cisco Vision to synchronize a new display strategy for the building’s main concourse. “The idea was, let’s emulate what people see in the seats and bring it to the concourse,” Castro said. What was eventually installed over the past two seasons were the new wall-mounted displays, which joined the 240 TV screens and the 16 hanging pendant displays (with six screens each) that were already in the concourses. According to Castro the Sharks took down eight static signs to make room for the new, interactive displays. All the new displays make use of Daktronic’s new Narrow Pixel Pitch (NPP) technology, which feature 2.5-millimeter line spacing. The close alignment of the LED lights in the displays makes them sharp even from close distances, with a look and feel more like a traditional TV screen than an LED ribbon board. By using LED technology, not only are the boards more flexible in what kind of content they can carry, but they are also cheaper and more resilient than TV screens, something Hall said matters a lot to venues like SAP Center that may see up to 300 live events a year. “If you have TVs, you have to replace them often, and over a lot of hours [the expense] is hard to justify,” said Hall. 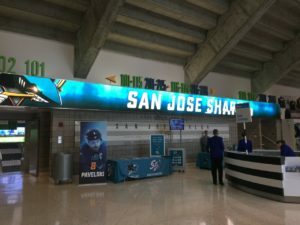 With its LED technology, Daktronics was able to create custom size boards to fit different areas in the concourse (like above the entry and exit doorways, or above the main entry openings to the seating bowl), giving the Sharks lots of flexibility to build their new concourse viewing experience. 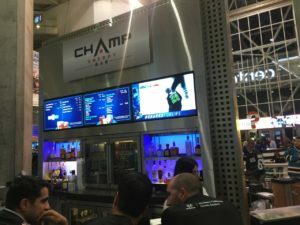 To make fans take notice of the new displays, the Sharks turned to Cisco and its Cisco Vision IPTV display management system, which allows teams and venues to program and run multiple displays from a single management system. 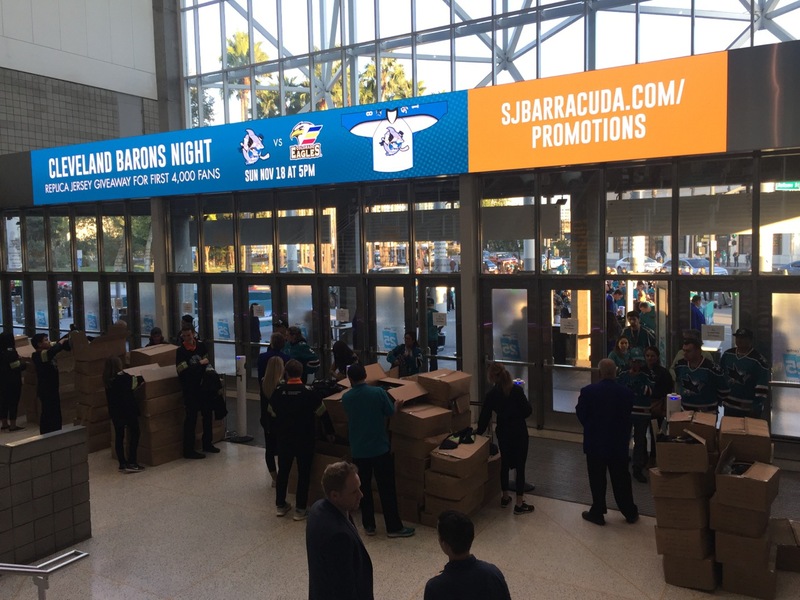 Cisco also brings to the table years of experience in designing, deploying and selling display systems and system content, which can help teams like the Sharks not only keep fans more engaged but also help the team improve its digital ad sales. 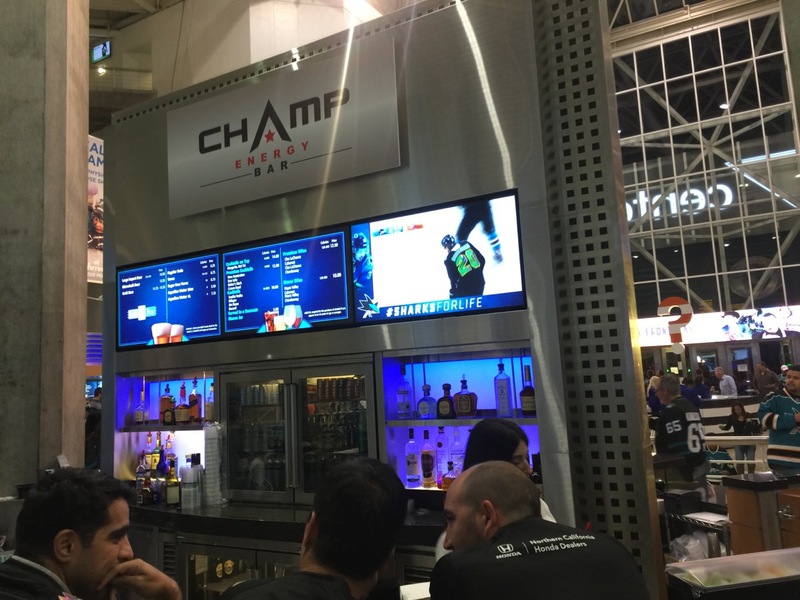 Cisco, which supplied the Wi-Fi gear when SAP Center got its new wireless networks a couple years ago, teamed up with network deployment partner AmpThink to deploy a new display system at the same time, often doubling up on infrastructure. At many points inside the arena, a display screen is mounted in the same space as a Wi-Fi access point, an efficient design that combines aesthetics (the APs are hidden behind the screens) with cost savings. According to Ken Martin, executive director of digital transformation for the consumer industries in the Americas and for the sports and entertainment industry globally at Cisco, the Sharks’ previous display system was limited in its capabilities, especially in the ability to change things like menu boards easily between events. 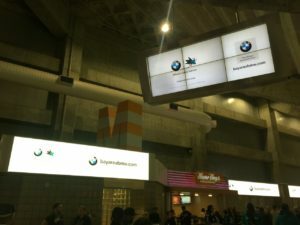 Martin also said the Sharks had four different signage solutions for the various boards and displays throughout the stadium, making it hard to coordinate programming across screens. Now with Cisco Vision in place, the Sharks can build “shows” of content and advertising that flow from screen to screen, or arrive simultaneously on multiple screens to increase the visual effect. Inside the SAP Center concourses, the new Daktronics panels combine with an previously existing infrastructure of screen displays hanging over the walkways to create a visual “wall” that draws the eye. “The way [the screens] are positioned, you cannot stand in the SAP Center concourses without being hit by something,” Cisco’s Martin said. The Sharks’ Castro said there “was a lot of discussion and research” about the placement of the signs. “Whether you turn left or right, you’re always going to see an LED,” Castro said. Through its professional services that are part of the Cisco Vision deal, Cisco also helps the Sharks brainstorm with potential sponsors to create digital display advertising ideas, and then also helps create, produce and run the “show” of ads that streams across all the stadium’s displays. A current campaign with BMW is an example of using all concourse screens simultaneously to create an immersive feel to the advertising. With Cisco Vision, the Sharks are able to not just coordinate a “show” of ads and other content during the game, but they can also break in and trigger special screen content when something happens live, like a goal being scored. Such “takeover” moments are just another new asset that can be added to the ROI for a smart digital display solution, something not possible with static display systems. Such timely messages can really catch the fans’ eye, especially so at hockey games where people pay attention when they aren’t in their seats. To help those fans, one of the live action content pieces run across most of the concourse boards at SAP Center is a live clock that counts down the time until live action starts again. 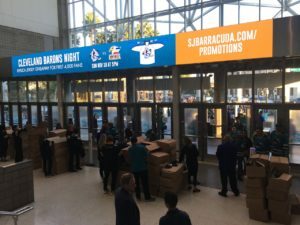 For the Sharks, the new system is already returning dividends; according to Castro, some 80 percent of all new digital display sponsorship business includes Cisco Vision integration as part of the opportunity.